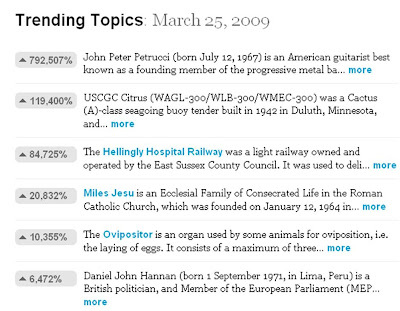 Wikirank is a free tool that tracks traffic to Wikipedia pages. They say "it’s based on the actual usage data from the Wikipedia servers, which the Wikimedia foundation makes available as a public service. We take that data, process it, and give it back to you in a format that’s easy to use and share. 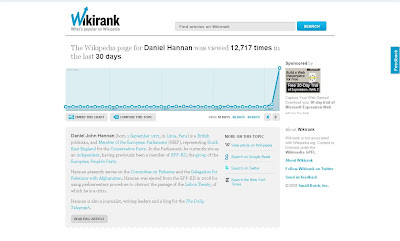 Wikirank reveals emerging trends, and lets you embed relevant charts in blog posts and on social media sites." The impact of Daniel Hannan's 'devalued Prime Minister' speech is therefore seen on Wikipedia traffic - he comes from nowhere to overtake both Gordon Brown and David Cameron. This is yet another aspect of social media monitoring and is an example of how the impact of offline events can be measured online. In this case a political speech has been amplified through YouTube with knock on effects seen on Wikipedia traffic, Twitter mentions etc. Wikirank is a nice way of being able to show how Wikipedia consumption is affected and could be used to look at a range of things - from future political speeches to product launches to crises.